The Blue Cliff Record (Chinese: 《碧巖錄》 Bìyán Lù; Japanese: Hekiganroku) is a collection of Zen Buddhist koans originally compiled in China during the Song dynasty in 1125 (宋宣和七年) and then expanded into its present form by the Chan master Yuanwu Keqin (圜悟克勤 1063–1135). The book includes Yuanwu’s annotations and commentary on Xuedou Zhongxian’s (雪竇重顯 980–1052) collection 100 Verses on Old Cases 《頌古百則》— a compilation of 100 koans. Xuedou selected 82 of these from the Jingde Chuandeng Lu 《景德傳燈錄》 (Jingde (era) Record of the Transmission of the Lamp), with the remainder selected from the Yunmen Guanglu 《雲門廣録》 (Extensive Record of Yunmen Wenyan (864–949). Yuanwu’s successor, Dahui Zonggao (大慧宗杲 1089–1163). wrote many letters to lay students teaching the practice of concentrating on koans during meditation. But Dahui did not explain and analyze koans. Oral tradition holds that Dahui noticed students engaged in too much intellectual discourse on koans, and then burned the wooden blocks used to print the Bìyán Lù. 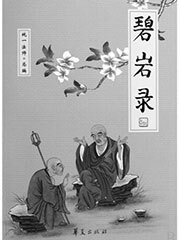 Another key tradition regards Dogen Zenji (道元禅師; 1200–1253), a founder of the Soto Zen sect: After an extended visit to China for the purpose of studying Zen, on the night before his planned return to Japan, Dogen saw the Bìyán Lù for the first time, and stayed up all night making a handwritten copy of the book. Similar publications included Zutang Record 《祖堂錄》 and the Xutang Record 《虛堂集》, as well as others.